An article published in the Asian Correspondent talks about Thailand's education reform and how it has failed to address so many issues, most importantly, the existing inequity in education. It is particularly striking to see the Philippines mentioned in one of the sentences. And it is not gratifying: "According to this most recent data, the only countries in Asia with a worse record of opportunities for education are India, Pakistan, Bangladesh and the Philippines." It was back in February of 2012 that I received an email from the mayor of a town that is not too far from Manila. The email said, "Just a bit of news: I attended the welcome party for the new District Supervisor and I was really surprised that she and the other supervisor are not aware of the proposed extended years for high school. They said they heard something about it but no definite instructions yet. I told them that according to the news these will be implemented in 2012 school year." It is easy to claim on a poster that a particular education program is for the underprivileged. One can simply grab a photograph showing a group of children and paste a couple of sound bites like "The right to education is for everyone. Not implementing K to 12 is anti-poor." However, whether the claim is true or not depends on evidence. To gauge whether DepEd's K to 12 is pro-poor, it boils down to one issue, equity. In this aspect, it is not difficult to see that DepEd's K to 12 fails in so many ways with regard to addressing the gross inequities in Philippine basic education. 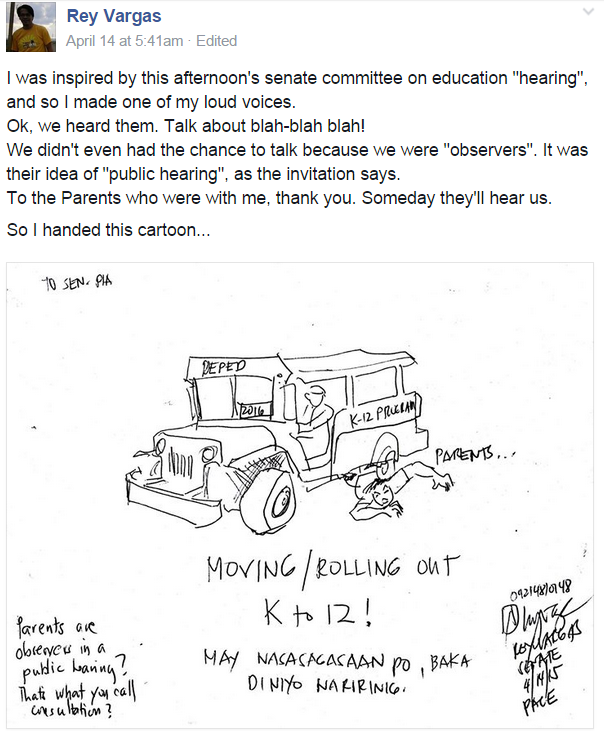 This blog has focused on the lack of research backing DepEd's K+12 curriculum. This blog has in fact enumerated a long list of reasons why DepEd's move to overhaul basic education in the Philippines is not founded on good evidence. This blog has also lamented the fact that Philippine lawmakers have not examined thoughtfully the new curriculum and have needlessly rushed to pass the Enhance Basic Education Act of 2013 (Republic Act 10533). 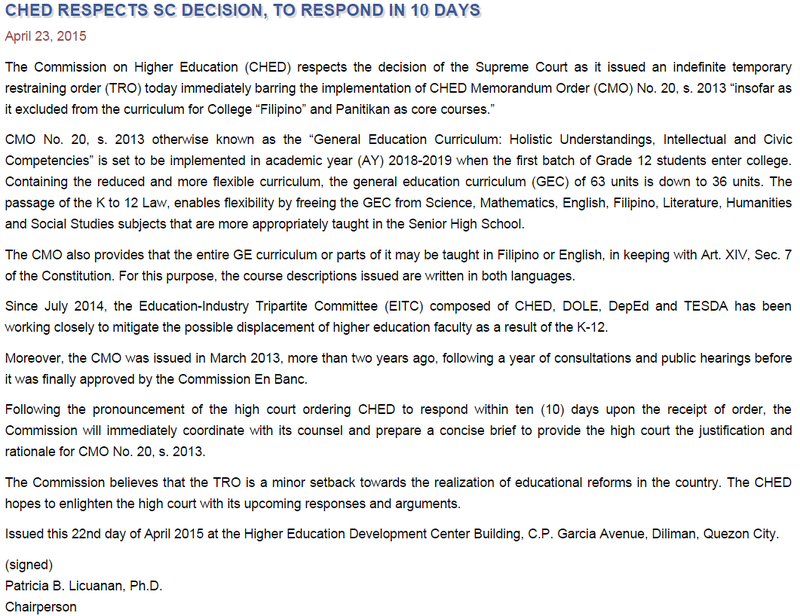 Thus, in addition to lack of sound research, DepEd's K+12 is now facing legal challenges. 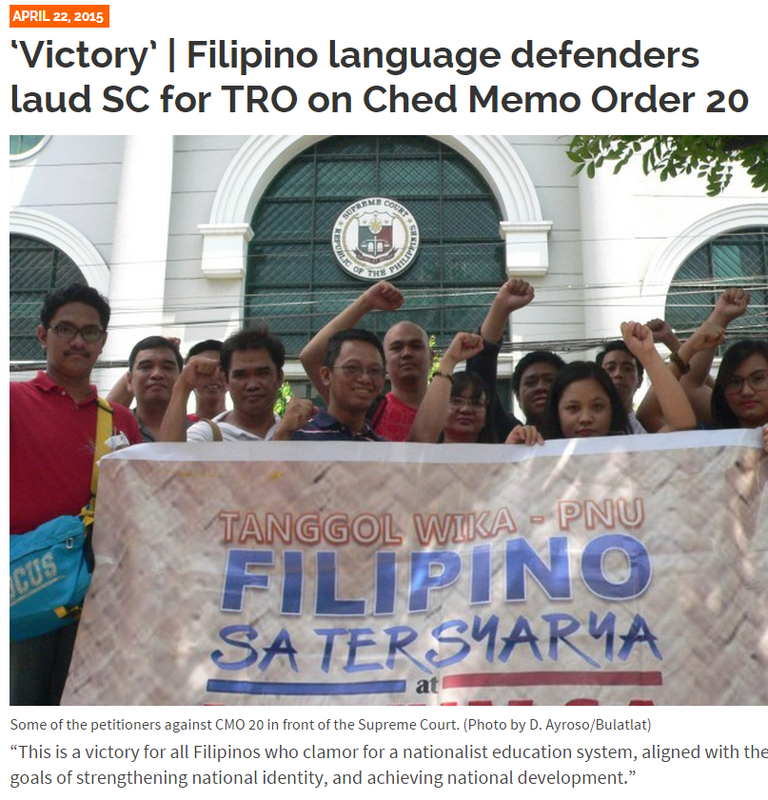 Perhaps, DepEd has already asked for an extension from the highest court in the Philippines. A month has passed since the Supreme Court's order to various government agencies to respond to a challenge that DepEd's K+12 undermines the Constitution's protection of labor rights. 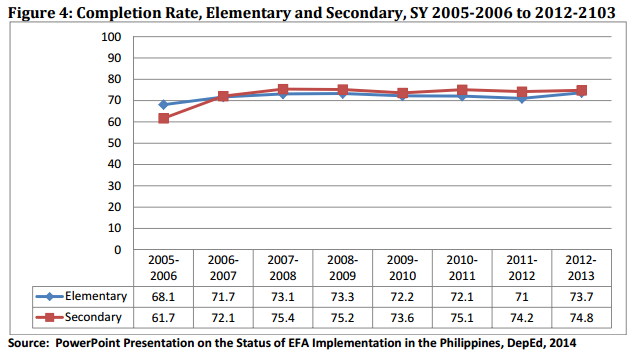 If there is a gap that needs to be addressed in Philippine basic education, it is the completion rate. 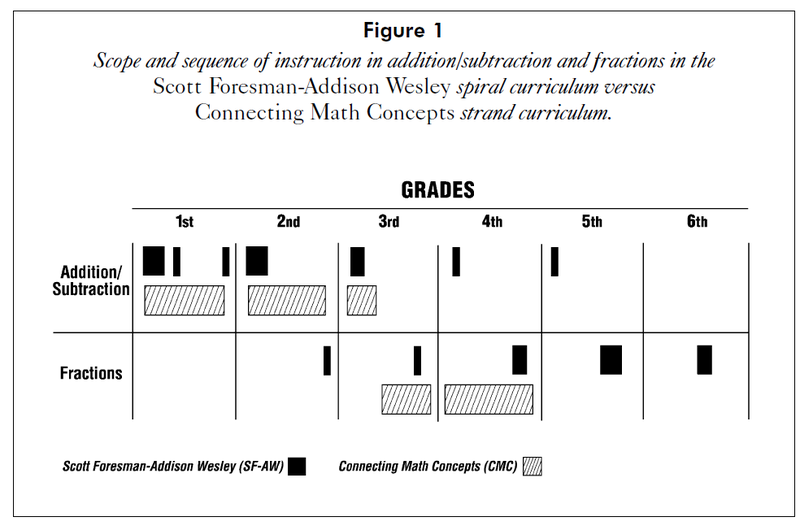 The completion rate in both elementary and secondary levels has stubbornly remained near seventy percent. "Instead of adding two additional years, why not first fix the foundation in the primary education?" is a statement made by Rene Tadle, a professor at the University of Santo Tomas and lead convenor of the Council of Teachers and Staff of Colleges and Universities of the Philippines (COTESCUP), during a discussion on DepEd's K+12 curriculum. 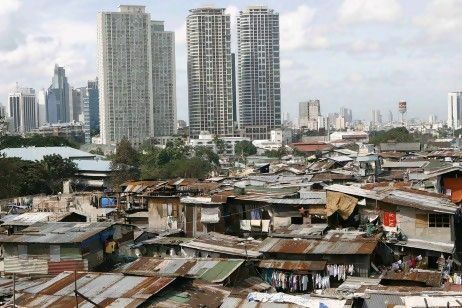 Reflecting on a photo of slum dwellings with skyscrapers in the background provides an image that appropriately describes DepEd's K+12 curriculum. It is a picture of ambition towering over inequity. It depicts a story of great heights being captured in illusion with the reality of a weak foundation. There are three reasons why the education reform initiated by the Aquino administration is very likely to fail. The first reason is obvious, as stated by Nick Morrison, in an article published in Forbes, "Education Reform Will Fail Unless You Get Teachers on Board". 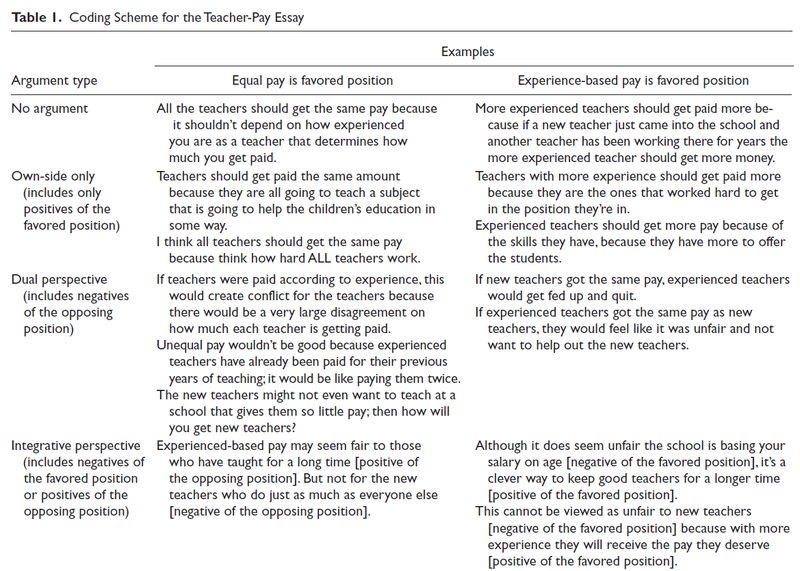 In the article, Morrison specifically describes what it means by not having teachers on board, "Too many education reforms are imposed on teachers, who are told what they have to teach and how they have to teach it," echoing OECD’s Director for Education and Skills Andreas Schleicher's statement, "Teachers are not just part of the delivery of reforms." 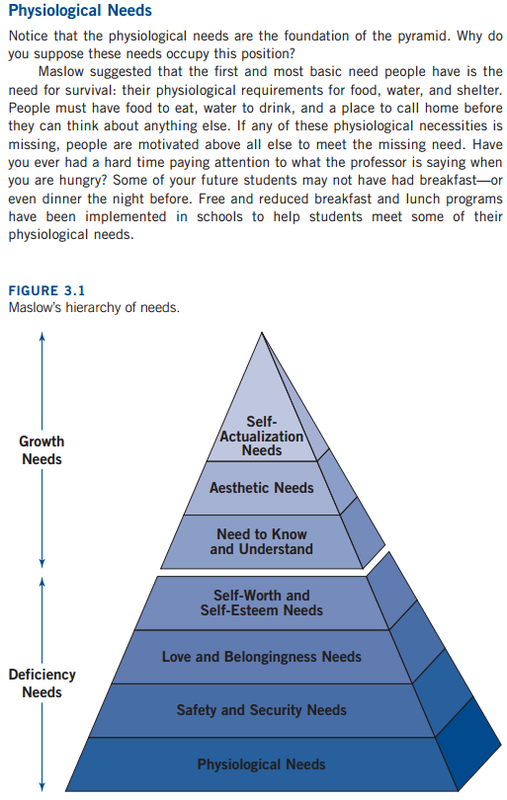 In any human cognitive task, a higher level of thinking is more likely to happen when basic skills have been mastered. The human brain with its limited working memory can focus more, for instance, on algebraic problems if the brain no longer needs to concentrate on correctly performing arithmetic operations. The same goes with reading. As a child becomes familiar with words, a child can now focus more attention on what meaning a series of words in a sentence are trying to express. 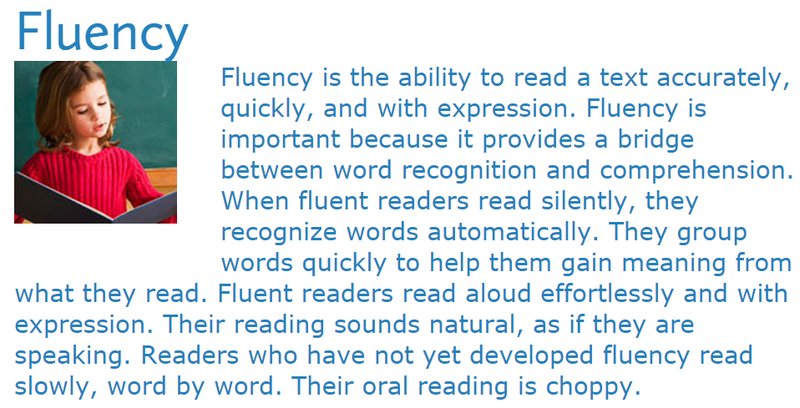 In all disciplines of human learning, there is fluency. As a faculty member in a department that offers a doctoral program, the question of whether critical thinking could be taught probably sounds rhetorical. A doctorate in philosophy after all requires making a contribution to human knowledge, extending what we know, and defending this original contribution before the faculty. Solving a consequential problem for the first time obviously requires critical thinking. 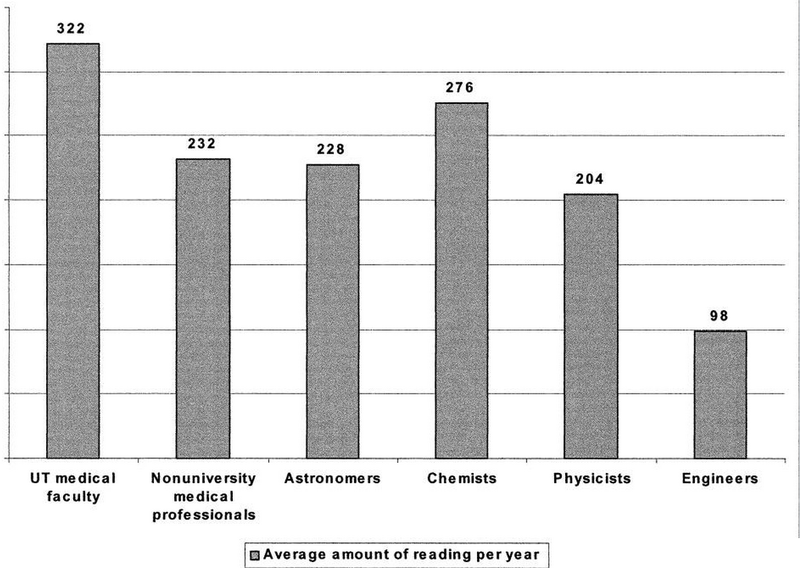 During doctoral training, the student acquires this ability through practice and examples. Critical thinking, like any ability, is often caught, not taught. With the desire to promote critical thinking in basic education where teachers do not normally engage in original research, it is timely to ask whether critical thinking can in fact be taught.